25 Apr 2012 22 Apr 2014 wcalvinandersonmedLeave a Comment on NYC : As Congressman Ed Towns Prepares to Leave Office: Get to Know His Agenda and THOMAS My Friends! NYC : As Congressman Ed Towns Prepares to Leave Office: Get to Know His Agenda and THOMAS My Friends! The Transition of Power = The Voice in Representative Government! 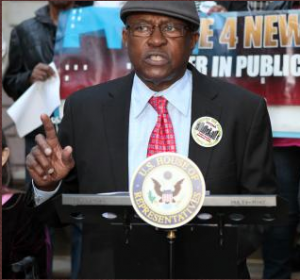 Congressman Edolphus “Ed” Towns (10th District NY) has announced his plan to retire from the House of Representatives after 16 terms but what does this transition of power mean to the American public in his district and across country based on the impact of Ed Towns in vital committees? Let’s face Democrat freshman have not upset the nation like Republican freshman these days. When we lose a people’s champion and an efficiently run “office” in Washington, DC it takes more than typical “freshman” promises to restore power — so let’s look in the coming weeks at the legislation and the ideas of Congressman “Ed” Towns. Whether Mr. Jeffries or Barron seeks to fill the shoes of the former Chairman we will have to follow his large 30-year footprint with a vigilance to be involved in the process and to get to know THOMAS as the “office” is groomed to respond to the constituencies of the 10th district and the nation adapts to his absence and “standing” in critical committees. Latest Major Action: 3/4/2011 Referred to House subcommittee. Status: Referred to the Subcommittee on Higher Education and Workforce Training. Urban Jobs Act of 2011 – Amends the Workforce Investment Act of 1998 to authorize the Secretary of Labor to make grants to the National Urban League to operate, through local affiliates, an Urban Jobs Program to provide job training, education, and support services and activities for eligible young adults to prepare them for entry into the workforce. Defines “eligible young adults” as individuals ages 18 to 24 who: (1) are not enrolled in secondary or post-secondary school, or (2) are or have been subject to the criminal justice process. Directs the Secretary to establish a National Jobs Council Advisory Committee. Expresses the sense of Congress that National Urban League affiliates should establish local jobs council advisory committees to aid in establishing local community support for local implementation of the program. We will certainly have to get to know “THOMAS”. Thomas… is the public information repository for legislative information in Washington, DC. THOMAS was launched in January of 1995, at the inception of the 104th Congress. The leadership of the 104th Congress directed the Library of Congress to make federal legislative information freely available to the public. Since that time THOMAS has expanded the scope of its offerings to include the features and content listed below. Categories PoliticsTags Charles, Congressman Ed Towns Resigns; fice: Get to Know His Agenda and THOMAS My Friends! Previous Poetry : Transparency is a Sport Too!